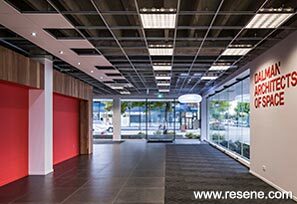 Dalman Architects moved back to the Christchurch central city to a studio office with a design that was inspired by the ancient totara forests located on the Colombo Street site. The move was a precursor to the upcoming celebration of 20 years in business for the architects and interior designers, making totara an appropriate symbol that represents longevity and strength. 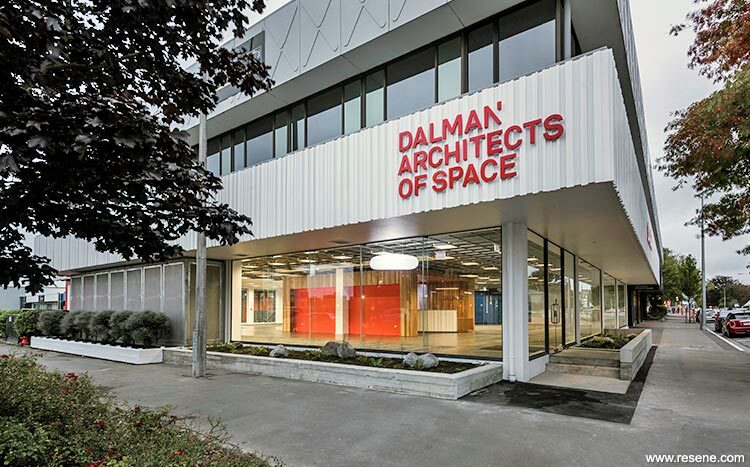 The opening also coincided with a refresh of the brand identity and a name change to Dalman Architects (formerly known as Dalman Architecture) that was unveiled on the night. The studio, located on the corner of Colombo and Peterborough Streets, is clad with timber battens of various widths that represent looking through the trunks of the ancient totara forest, and a garden featuring sculptural forms of timber trunks, rocks and ferns reminiscent of a regenerating forest floor. 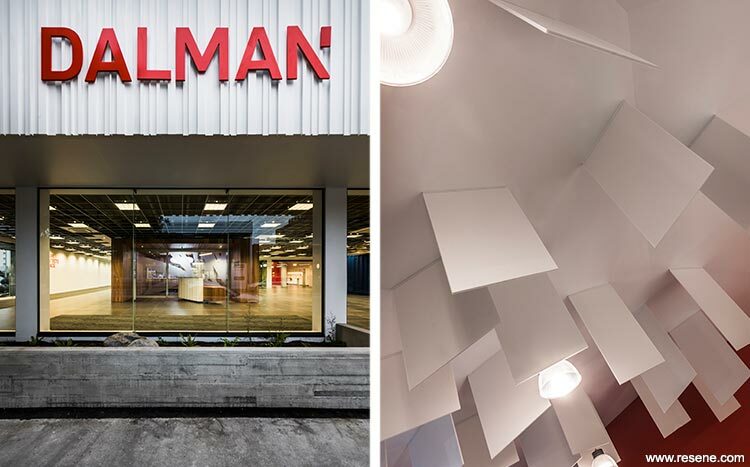 A large Dalman D brightens up the south façade of the building. The full height, red pivoting door on the Colombo Street site, is an important connection to Dalman’s award winning pre-earthquake Durham Street site, well-known for its red meeting room that protruded from the now demolished brutalist building. The colour also represents the red berries of the totara tree. An exhibition space occupies the front entrance and attracts curious passers-by with its architectural models, and totara sculptures provided by Di Lucas that were found under the former Christchurch Star building along the road. At the heart of the office is the ‘Totara Room’, a space fully lined inside and out with totara tongue and groove boards, creating a warm texture against the slate-coloured tile floor. 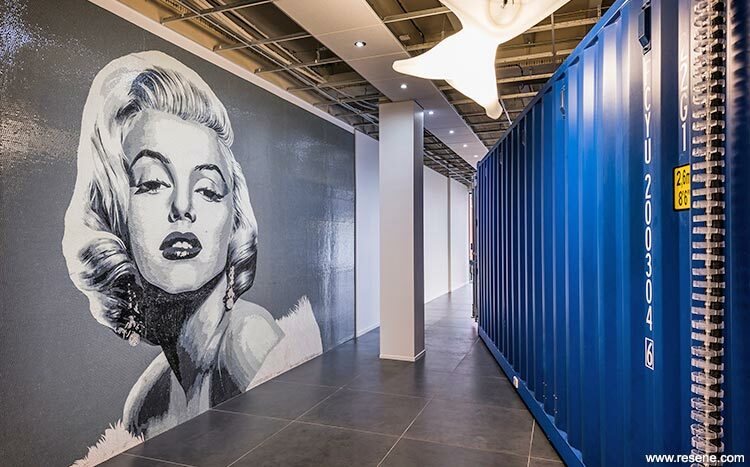 To the north-side of the office space is the installation of a deep blue 20 foot container. The container was converted into a meeting room and pulls a grin and talking-point from visitors especially Cantabrians who are used to the multi-purpose function of containers post-quake. The backdrop for the office is the bright Resene Black White. The accent colour, Resene Pursuit, are the vista through to Colombo Street and provides a warm and bright backdrop. These two main paint colours are complemented by the natural totara colour, the industrial blue of the container and the natural concrete grey of the floor above that has been exposed by the removal of ceiling tiles. Totara walls and veneer are finished in Resene Aquaclear Satin to enhance and protect them. The exterior cladding in Resene Sonyx 101 in Resene Black White changes with shadow as the morning sun moves. This is teamed with a feature wall in Resene Dalman Red, Dalman’s signature brand colour and exterior details in Resene Half Fuscous Grey.